One of the most challenging aspects of the mall kiosk business involves engaging with customers. So far, our series on mall kiosks has discussed how to get started in the business, how to pick the right size for your kiosk and how to keep your merchandise secure. Now let’s talk about the human side of your business – turning the foot traffic swarming all around you into mall kiosk customers. Making sales is a matter of percentages. Of the hundreds of people passing by each hour, perhaps 20% will notice your kiosk. A smaller number will stop and browse. Even fewer will actually buy. So it stands to reason that the more you can boost initial awareness of your kiosk, the greater the number of sales you will make. 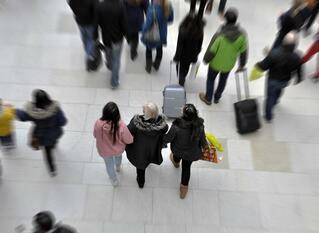 But even after shoppers have noticed your kiosk from afar, what do they see as they get closer? Someone who looks bored or is reading a book? The back of someone perched on a stool? Or, will they see someone who appears approachable and potentially helpful? It comes down to customer service. You’ve heard it before, but it’s just as true when you’re interacting with kiosk customers as it is when you’re selling in a well-known in-line or storefront retail operation. The big difficulty for many kiosk employees is resisting the urge to accost shoppers and haul them over to the display, although some kiosk owners might say their biggest problem is apathetic employees who don’t engage with anyone at all. There is a happy medium here, and that’s your goal – the kind of friendly, personal service customers expect from any other store. Hire the right people, and train them well. Look around, to see who may be looking your way. Employees who smile and make eye contact with people who are nearby are far more likely to draw them over than those who try to force the issue. Most malls now have specific rules about how far you can venture into the aisles to “capture” mall kiosk customers. Greet them and listen to what they have to say. Pick up the product they’re looking at and let them handle it. Demonstrate it, if that’s appropriate, and tell them how it will benefit them. Your kiosk itself should engage and sell right along with your employees, if you want to make the most sales. One trendy – and highly effective – way to do that is with digital displays, especially if they are interactive. Customers who are hesitant to approach because they don’t want to talk with a sales person are often much more comfortable stepping up to watch a video or perform some type of self-service task. This then opens the door for one-on-one engagement. We hope you’ve found our series of articles on opening and managing a kiosk business helpful. We wish you tremendous success! Palmer Retail Solutions strives to offer our clients the absolute best combination of innovation, quality, service, and value for our diversified custom store fixtures and merchandising displays. For more information about our designs, retail fixtures, cash wraps, kiosks, or point of purchase displays, visit our website at: http://www.palmerretailsolutions.com.